When you build a collaborative leadership approach, you build an organization capable of gaining competitive advantage. Here we look at 7 ways to build collaborative leadership. In an environment of collaborative leadership, organizational change is more easily affected and creates a more caring business. However, shifting to an organizational philosophy that benefits from all the advantages of the collaborative leadership approach takes time and effort. You may also find some resistance (some people may be resentful at the ‘delegation of leadership duties’). Collaborative leaders will need to be adept at conflict resolution (care-fronting instead of confronting, for example) to arrive at solutions acceptable to all. Without trust the collaborative leadership approach will fail. This is the first area in which the leader must lead. Trust is a two-way street, and people who are trusted tend to trust. Encourage your leaders to have trust in their people. Leaders no longer lead by command and control. Instead they encourage the adoption of shared values and visions as a motivator of performance. 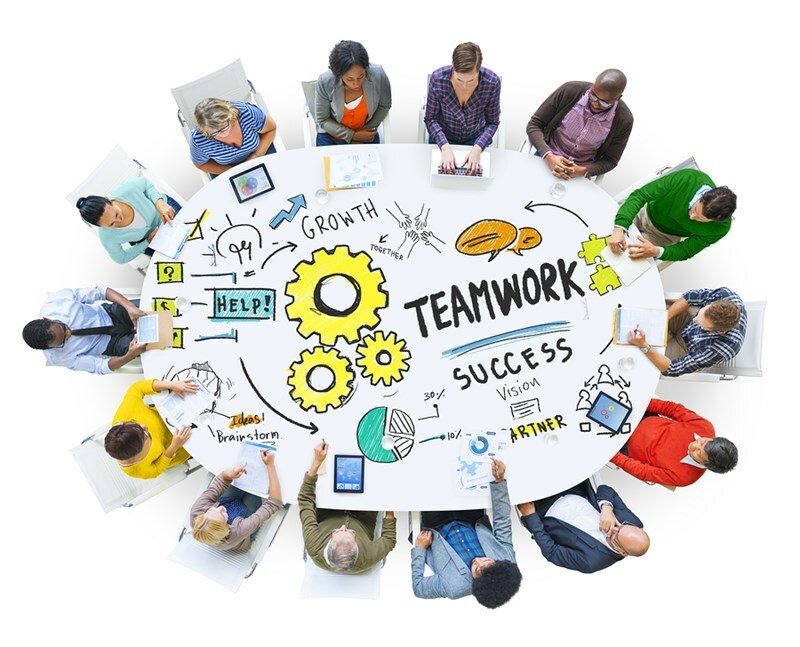 The collaborative leader communicates the future vision through commitment to it. He or she is passionate about the organization’s values and mission and that passion permeates across a flatter organizational structure. Collaborative leadership encourages everyone to participate in problem solving, and these diverse teams produce more meaningful and long-lasting solutions to problems. The collaborative organization benefits from a range of views, skills, experience, and ideas from people working toward the common goal. Leaders show initiative, and encouraging ownership of problems and their solutions is to encourage initiative. Accept that people should take calculated risks. Encourage creativity and self-improvement. People want to make their jobs as easy as possible. Accept that a degree of risk-taking is necessary to drive change for the better. Flatten the hierarchy by sharing information across all organizational functionalities. Involve people with information and you encourage ownership and collaboration. Your organization will become more adept at change and better at decision-making. Information is no longer power, but rather a tool of inspirational leadership. Share information and you build trust, openness, and honesty. Collaborative leadership requires the sharing of information and responsibility. This empowers an organization’s people to contribute to the decision-making process. Collaborative decision-making leads to commitment to implement discovered solutions. Less time is wasted in conflict management, and more energy is focused on understanding the challenges that influence the business. Transparency of decision making leads to buy-in and acceptance of responsibility for effectiveness of solutions. Diversity will inevitably lead to conflict. Create an environment where constructive conflict is accepted as part of the decision-making process. This conflict must be managed, and will then inevitably lead to greater insight as feedback is sought and given. Constructive conflict will aid creativity, innovation, and problem solving. For details of the Forward Focus Management Development Series contact us today and discover how collaborative leadership will drive your competitive advantage through 21st century. Only 1 in every five workers thinks their boss is a good leader. How do you get your employees to want to work with you, instead of just working for a paycheck? A collaborative management style has many benefits, providing the leader knows how to engender engagement and deal with conflict. An underperforming leadership team can be turned around and re-energized, when it benefits from the ten golden rules of leadership. Increased productivity is a direct benefit of an engaged workforce. These servant leadership principles will help your team achieve peak performance. A leadership style assessment, printable in format, will help leaders identify their natural style. Emotional intelligence is the key that separates out good leaders from poor leaders. To supercharge your team, employ this leadership practices inventory from self-awareness to transformation and engage your employees. You Want Your Team to Change: Should You Guide It, or Inspire It? Charismatic or transformational? Which leadership style is best suited to guiding sustainable change in the modern economy? Why an autocratic leadership style will not produce the transformational change expected, and what leadership quality to develop to do so.